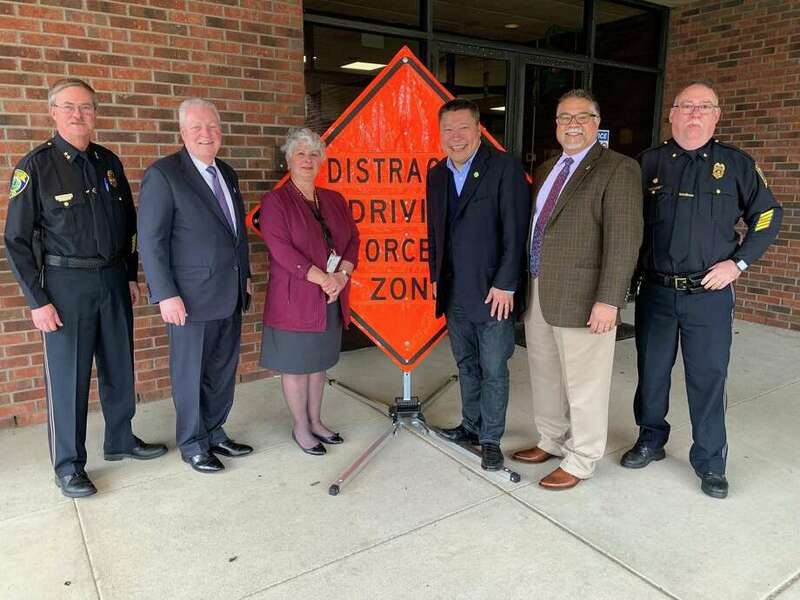 The Distracted Driving Awareness program kicked off at Fairfield police headquarters Monday as State Senator Tony Hwang led the initiative with support from First Selectman Mike Tetreau, Police Chief Chris Lyddy, police officers and traffic safety advocates. Related data was presented by Neil K. Chaudhary, CEO of Preusser Research Group, Inc.; and Fran Mayko, AAA Northeast spokeswoman. “Most of us are guilty of distracted driving because we naively think nothing dangerous will happen to us,” said Hwang. “When you are not paying full attention to the road in front of you, there is a highly increased chance that you will have an accident as a result of either your own actions or the actions by another you are unable to avoid. AAA says mental distractions last much longer than you think. The AAA Foundation for Traffic Safety, in groundbreaking research, has found hands-free interactions can distract drivers for as long as 27 seconds after a conversation ends. At 25 mph, a driver can cover the length of three football fields during that time. He noted that Connecticut laws are among the strongest in the nation yet despite them, and with police enforcement efforts, there has not been a sustained decline in distracted driving. “Our recent work with the Connecticut Department of Transportation’s Highway Safety Office has shown that while cell phone use can be lowered through high visibility enforcement, the rates return to baseline after heavy enforcement is taken away.” Among top concerns of distracted driving are the risks to school aged children near school bus stops and schools. “Distracted driving is real and all it takes is a fraction of a second for a tragedy to occur,” added Hwang. “Put the phone down.” A forum on the issue will be held at the Pequot Library, 720 Pequot Avenue, in Southport on April 30 at 6:30 p.m. Hwang, Officials, AAA representatives, law enforcement and traffic advocates will participate, and the public is encouraged to attend.